The SR 100 half mask is made of silicone in tree sizes, i.e. S/M, M/L and L/XL. The mask is equipped with two exhalation valves, which ensures very low exhalation resistance. The valve covers with partitions effectively protect the exhalation membrane against dust and paint mist. The material and pigment of the mask body are approved by FDA and BGA for foods, which minimizes the risk of contact allergies. The easily adjustable elastic head harness straps of the mask are designed as a V-shaped loop and have a large dished crown plate, which contributes towards a comfortable and safe fit. 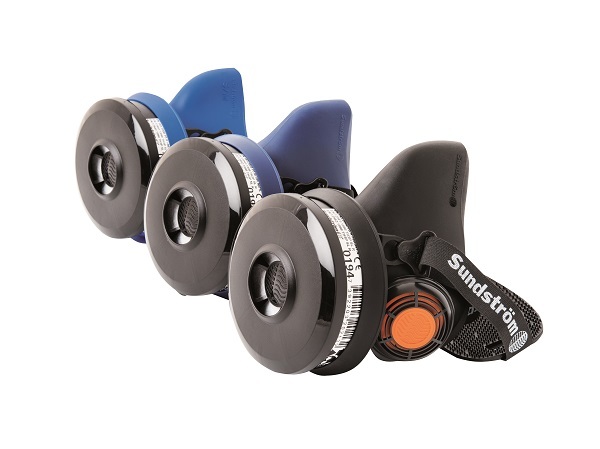 The mask is used either as a filtering device in combination with filters from the Sundstrom range, or in combination with the SR 307 compressed air attachment which then serves as a breathing apparatus with continuous flow for connection to a compressed air supply. A pre-filter holder and test disc for simple checking of the performance are supplied. Best stored in box SR 230 or storage case SR 339.